BRISTOL SHOW 2013: Focal launches XS Book Wireless speakers | What Hi-Fi? Focal has launched a wireless version of its popular XS Book desktop speakers, unsurprisingly called the XS Book Wireless. The active speakers use aptX Bluetooth to stream audio, making them compatible with laptops, phones and tablets. On display for the first time at the Bristol Show, the Focal XS Book Wireless is due out in May and will cost £249 (making them the same price as the XS Book, which we figure may be in line for a price cut). We're big fans of the original Focal XS Book and the wireless version will look to build on that, cutting a familiar profile but coming in black or white. 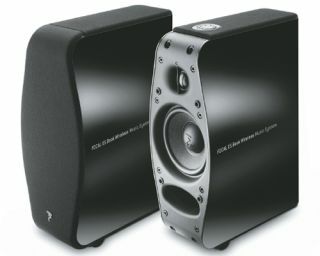 A 2-way bass-reflex active speaker, they use a 4in midbass driver and a 19mm aluminium tweeter. As well as wireless Bluetooth, there are standard stereo and 3.5mm audio inputs, and Focal supplies a 1.5m audio cable, too. The Focal XS Book Wireless is due in May for £249.